Yay for a fun birthday! Today was very fun, actually, despite my still being sick ^_^. At like... 7am, my mom calls and sings happy birthday to me obnoxiously loud through the phone XD;. Then I went back to sleep. Then at 8am, my father calls and demands I come down and meet him at the front door of my dorm building. I stumble outside, and my efforts are rewarded with him giving me a huge flower-shaped birthday cake my mom made for me. It was very pretty, and was scarily yellow ^o^. I skipped 2 out of 3 classes today, which already made the day more fun, since I didn't officially get out of bed until 10am... I got an essay back that I was scared to see the grade of, but I somehow ended up getting an A on it, and then my father whisked me away for lunch at 12:15 after class. And then... I came back to the dorm and took a nap XD;. So much sleeping today! Stupid cold ^^;. At about 5:30pm, Rebecca jumps on my bed, and demands that I pick out a place to eat, because she's starving. We decide on going to Cheddar's, which was pretty good, and both Rebecca and Noa treated me to that ^^. We got some free movie tickets from the college's student center office yesterday, so Noa, Rebecca, and I went and saw Superbad at the movie theater... omg XD. I was so horrified during the first half hour, but it eventually had me trembling in constant laughter throughout the remainder of it <3. AND THEEE~N... after the movie, a trip to Wal-Mart is made, because apparently we needed to drink some Bailey's milk concoctions XD. Carolina was in the dorm when we got back, and she joined in our festivities of drinking and eating the cake that I mentioned at the very beginning of this post. We all decided we wanted to watch another movie while eating and drinking, so Queen of the Damned was popped in XD. So very random. And then it was suddenly midnight, and not technically my birthday anymore, so that's where my story ends XD. Thanks for the text messages Helen and Chibi ^_____^. And the call Staaaallion <3 <3 <3. Even my brother called me-- I wasn't expecting that XD;. 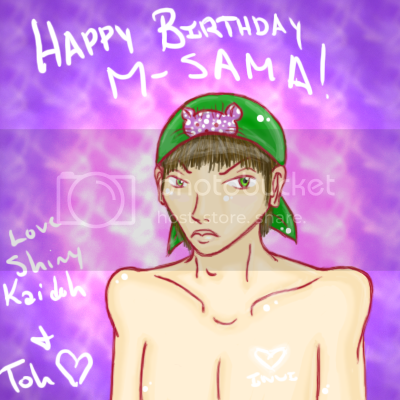 Plus, I had the pleasure of checking my e-mail today, and finding some v-gifts from a certain crazy senpai XD. I might post some pictures of me + friends + Bailey's + cake later, when I steal Rebecca's camera from her and upload the pics ^^. Edit: Also, ToH ( moeruze_burning)made me sparkly pretty fun'ness <3. Kaidoh always makes any day better, so thank you ^_^. I've been at school all day and only had like 2 minutes to use the computer T___T BUT HAPPY BIRTHDAY!!!! I'm still glad you had a good day. ... I feel so bad being so busy. T__T; I miss things. I understand the all consuming busy'ness, so no worries. Just try to get through it <3. Awwwww, ToooooooH, you made me a shiny sparkly picture ^_____^?!?!?! I am glad that your birthday went really well. Sleeping in is definitely for the win. ^_^ Uwah, Chibi gifting you so much is lovely. You deserve that and more you know!